Update: In summer, 2016, the Department of Veterans Affairs’ National Cemetery Administration in Washington, D.C. determined the grave marker incorrectly identified the soldier as Confederate. The marker was subsequently reground with a Union-style rounded top. Additionally, it was learned the stone misspells the soldier’s name. This post has been edited to reflect the correct spelling throughout. A distinctive headstone in Milwaukee’s Calvary Cemetery marks the last resting place of a Confederate Civil War soldier — the only one in row upon row of Union veterans of that conflict. But was Joseph Sheehy mistakenly buried as a rebel? One-hundred and fifty years ago, April 9th 1865, Confederate Army general Robert E. Lee’s surrendered to Union Army Lt. Gen. Ulysses S. Grant at Appomattox Court House, Virginia. Although scattered units continued fighting through June, Lee’s surrender largely ended the Civil War. The Civil War lasted four years and resulted in 1.03 million casualties, about 3 percent of the nation’s population at the time. At least 620,000 soldiers were dead, two-thirds by disease, while the number of civilians killed in the Civil War totaled 50,000. The human toll continued long after the last shot was fired. Milwaukee’s Soldiers’ Home, today the Clement J. Zablocki Veterans Administration Medical Center, was established to care for honorably discharged wounded veterans from both sides of the Civil War. 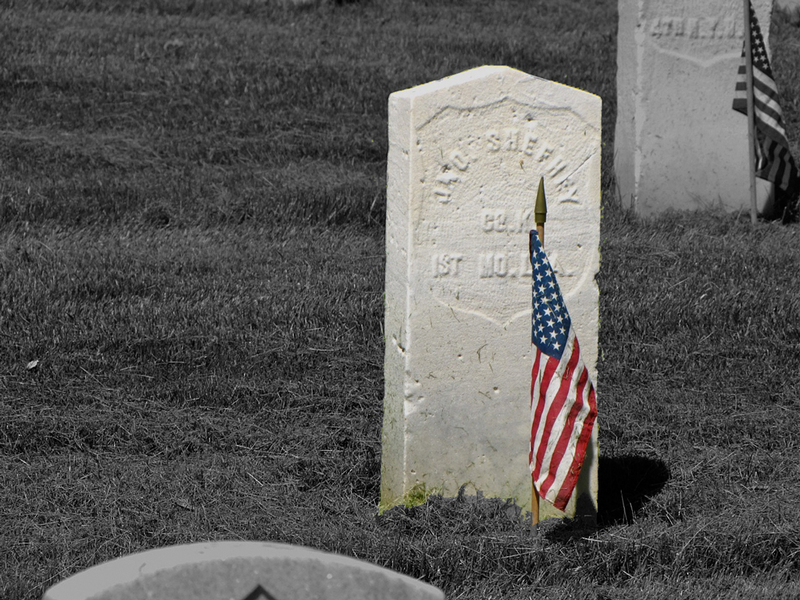 When death came, a veteran could count on a decent burial and a government-provided headstone. Most were laid to rest in Wood National Cemetery adjoining the Soldiers’ Home grounds. 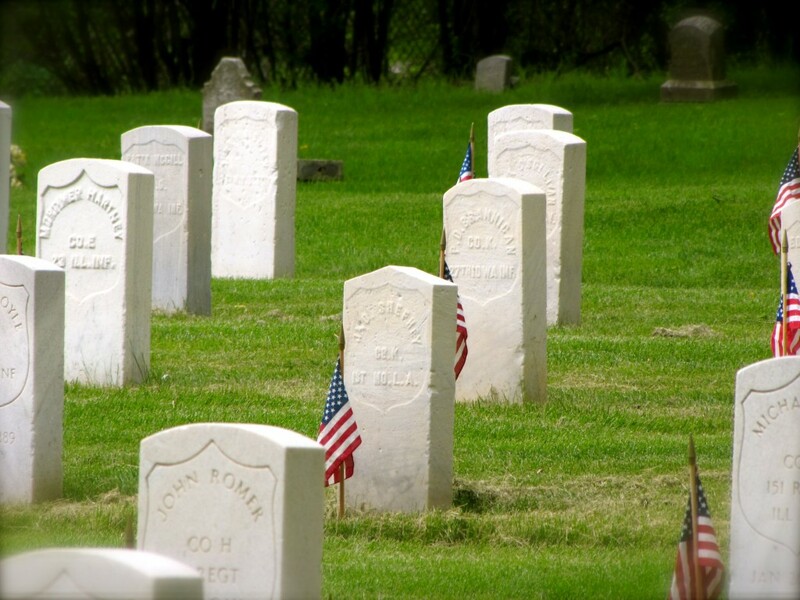 In 1876, the Archdiocese of Milwaukee donated land in Calvary Cemetery to Wood National Cemetery for the burial of Catholic veterans. There are 690 veterans buried here, including one Confederate veteran. His grave is easy to find. Originally soldiers of both sides had curved-top government headstones. But in 1906 a Confederate veterans’ organization succeeded in gaining federal approval for a distinctive headstone design solely for Confederate veterans. There is a old joke the former Confederates selected the pointed-top design to discourage Yankees from sitting on their headstones. The only peaked headstone in Calvary Cemetery is weathered but readable. J. Sheehy served with Company K, 1st Missouri Light Artillery. Missouri was a border state in the Civil War. Although the state stayed in the Union, quite a few Missourians fought for the South. Confederate forces did include a “1st Battery, Missouri Light Artillery” although no specific company designations seem to have been used. 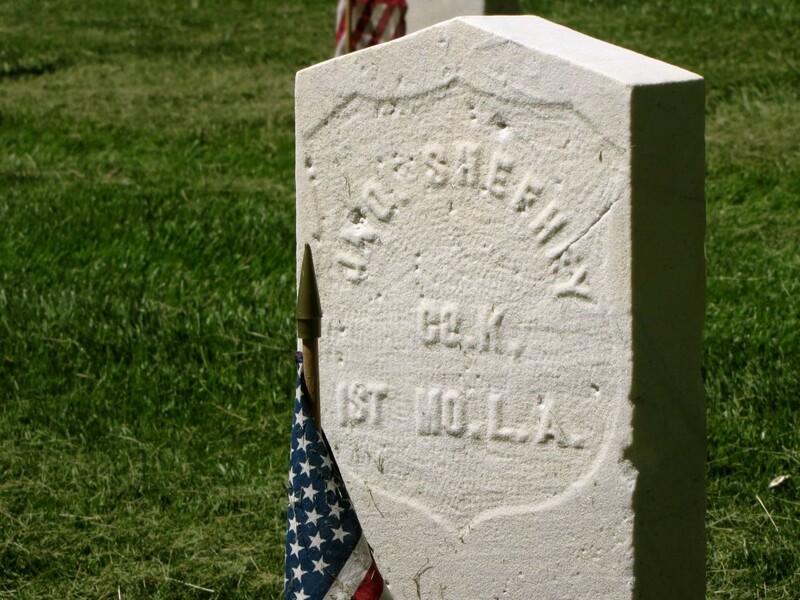 But Sheehy’s inscription more exactly matches that of the Union army’s “1st Missouri Light Artillery,” which included companies lettered A through G. Company K of the Union 1st Missouri fought with distinction throughout the war. At Grant’s victory at Fort Donelson, for instance, one Company K gun section took part in the charge that captured the fort. The men dragged their heavy cannon over fallen logs, through a barrier made from interwoven felled trees, and across ditches and, incredibly, still managed to reach the fort’s walls practically on the heels of the advancing infantry. When cemetery crews arrived to grind existing headstones of Confederate soldiers to a peak to conform with the 1906 design change, they may well have assumed Sheehy, a native of a border state, had been a Confederate. In fact, mistakes along those lines happened at least twice. In 2008, Paul Komlodi, a registered nurse at the Milwaukee VA Center, and Civil War re-enactor Rich LeCount proved two other veterans in Calvary Cemetery had been wrongly given Confederate grave markers. After 100 years, William Ryan of the 10th Tennessee and Lewis Jolliot of the 2nd Missouri received new Union-style headstones. Why not Sheehy? Kent Peterson of the Department of Wisconsin Chapter of the Sons of Union Veterans of the Civil War said the Veterans Administration examines requests to change military headstones very critically. Was Sheehy a Confederate soldier, the sole representative of the Southern cause buried in Calvary Cemetery? Or did he loyally serve under the American flag only to be wrongly laid to rest in a rebel grave? We may never know.